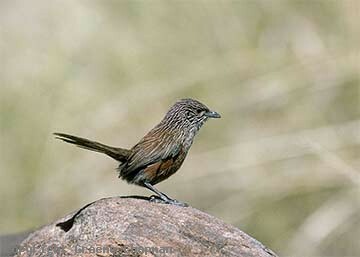 Kalkadoon Grasswrens were first, discovered in July 1966 by Bill and Helen Horton just south of the now defunct mining town of Mary Kathleen some 60 km east of Mount Isa. 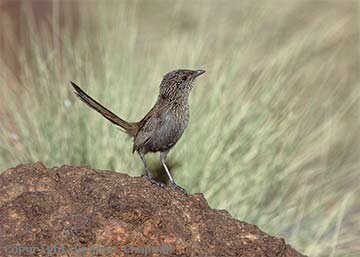 At that time, they were classed as a subspecies of A.purnelli, the Dusky Grasswren of Central Australia but recently they have been regarded as a full species. They are well distributed in the rocky hills on the outskirts of Mount Isa, but like all grasswrens, seemingly there one day and gone the next. The known limits of distribution at present are between Kajabbi to the north and Mt Unbunmaroo about 60 km NE of Boulia in the south, and from just west of Mt. Isa eastwards to Cloncurry, but there is much potential habitat to the south-east of this area. Ideal nesting territories for Kalkadoon Grasswrens are sheltered little gullies where the more vigorous clumps of spinifex provide suitable nesting sites (708208) and presumably more productive feeding areas. 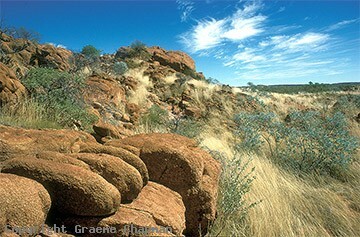 Widespread burning of spinifex for cattle grazing in this region is one of the threats to this species. 708201 ... Kalkadoon Grasswren, female. 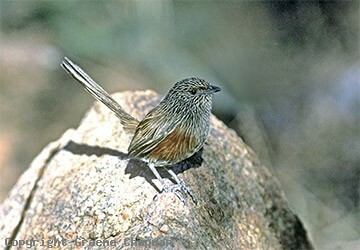 708202 ... Kalkadoon Grasswren, male. 708204 ... Habitat at Sybella Creek approx. 20 km S of Mt Isa. 708207 ... Females have distinctive chestnut flanks.